Situé sur la D21 Quietiste Military Cemetery is half-way from Le Cateau to Busigny, on the north-west side of the road (D21). 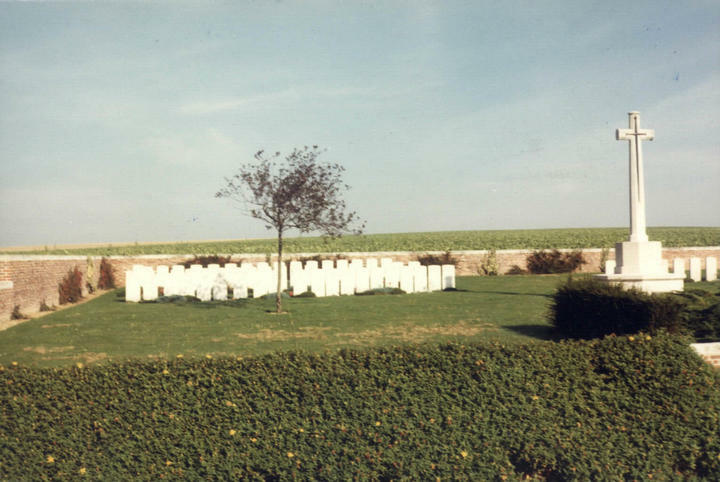 Quietiste Military Cemetery is half-way from Le Cateau to Busigny, on the north-west side of the road (D21). For further information regarding wheelchair access, please contact the Commonwealth War Graves Commission, Enquiries department, on 01628 634221. Le Cateau and the country West of it, were the scene of the rearguard battle fought by the II Corps on the 26th August, 1914, against a greatly superior German force; it then passed into German hands, and became a railhead and an important hospital centre. It was stormed by the 5th Connaught Rangers on the evening of the 10th October, 1918, and cleared during the following week. Quietiste Military Cemetery was made in October, 1918, by the 50th (Northumbrian) Division, as "Farm Cemetery"; the present name was acquired before the end of 1918, and is due to some association with Fenelon, Bishop of Cambrai, whose country house at Honnechy, 2.4 kilometres West, was used by both sides as Divisional Headquarters. The cemetery covers an area of 683 square metres and is enclosed by a brick wall, except on the roadside.